If this card is Summoned: You can add 1 “Machine Angel” Spell or 1 “Ritual Sanctuary” from your Deck to your hand. You can only use this effect of “Cyber Egg Angel” once per turn. Cyber Egg Angel is the first this week in cards dedicated to the Cyber Angel archetype. Small Level 2 Fairy that gets you your Machine Angel spell cards or a Ritual Sanctuary to immediately go into your Ritual Monsters. Doesn’t matter how it is summoned, it will give you something back. Five total cards in the game, but right now only three in the TCG, you still have many options to choose from, alongside the Ritual Sanctuary. Merciful Machine Angel can be your draw power, netting you a +1, while the rest are your other Ritual Cards. With Pre-Preparation of Rites and Preparation of Rites being run in the deck I’m not sure where Cyber Egg Angel would fit. It is a good monster to search out your Ritual Spell, but Pre-Preparation of Rites and Preparation of Rites can do that. It does lend itself to the summon of a Cyber Angel monster being a Level 2, but I’m not sure it’s worth a set in the deck. Happy Monday! We have a very simple card to start Cyber Angel week. Cyber Egg Angel is a Level 2 Light Fairy-type monster with 200 Atk and 300 Def. The stats are bad, particularly since Cyber Egg Angel is technically not a member of its own archetype. Atk and Def are bad, even for Level 2. Level 2 is at least good within the archetype for some Ritual Summons. When Cyber Egg Angel is summoned by any means, you get to search a Machine Angel Spell or Ritual Sanctuary from the deck to your hand. It’s a hard once per turn, but you can flip it, Special Summon it, or Normal Summon it and benefit. There are arguably better search cards in the deck making this card look and feel unnecessary. I wish it was a tuner to spice things up. Oh well. Maybe Cyber Egg Angel will hatch into something somewhere down the line. From Harpies we move forward into Cyber Angel Week, starting with Cyber Egg Angel. Cyber Egg Angel is a Level 2 LIGHT Fairy with 200 ATK and 300 DEF. Weird stats considering Wing Egg Elf (the card this is a retrain of) has 500 ATK and 1300 DEF and is Level 3, but neither pair of stats are good, but LIGHT and Fairy is. 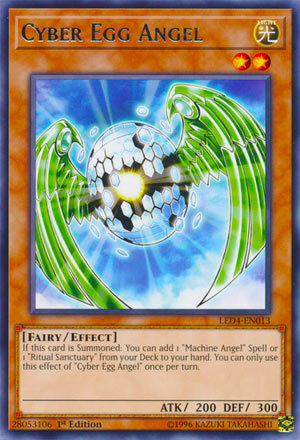 When Cyber Egg Angel is Summoned, you can add any Machine Angel Spell or Ritual Sanctuary from your deck to your hand. The Machine Angel Ritual Spells are searchable enough off Manju, Cyber Petit Angel, the Impcantations, and Sonic Bird but the archetype has other Machine Angel Spells that aren’t Ritual Spells, so this can search for those. Also with Terraforming seemingly going down the list, having another option to search for Ritual Sanctuary is really good to have considering how good that card is in the Cyber Angel deck. Also being Level 2, all you would need to do is shuffle back two Spells with Ritual Sanctuary to revive this and get more searches. Not too many searches, though, since Cyber Egg Angel is a hard once per turn. You got easy access to your new Machine Angel cards and Ritual Sanctuary with this card, so I guess it is a good one of since it is searchable as well and Ritual Sanctuary can keep reviving it and the fact that there are other cards to search for the most important cards in the Cyber Angel deck, but having a searcher for anything else just in case is great, especially at the very least to get more fodder to discard with Ritual Sanctuary for the other effect it has. Art: 3.5/5 A Cybernetic version of a card is what I expect from this name, now the TCG just needs Wing Egg Elf imported over here. Cyber Angel week is next up in our reviews of Legendary Duelist cards. We start off with a simple, yet necessary piece of the theme. Cyber Egg Angel is a rather small Monster, with but 200 attack and 300 defense, who’s also Level 2, and a Light, Fairy Monster. Stats are dismissive, but as you likely guess/know, you aren’t supposed to attack or defend with this card anyway. So, a Summon of this card nets you a Machine Angel Magic card or a Ritual Sanctuary Magic from your Deck to your Hand. Having access to any, not just your Ritual Magics in the theme is a very good ability to have on Hand. Given the plethora of Ritual Search cards (things like Manju of Ten Thousand Hands) and even in theme searchers, it makes you wonder just how worthwhile this is. But it comes back to versatility. Cyber Petit Angel doesn’t give you access to Ritual Sanctuary (which honestly I feel is a personal preference as to whether or not you’d use in this Deck) but options are always a good thing. It’s an asset to the Deck, to be sure, even if you aren’t using Ritual Sanctuary, and adds some (more) speed to a theme that already moves pretty quickly.